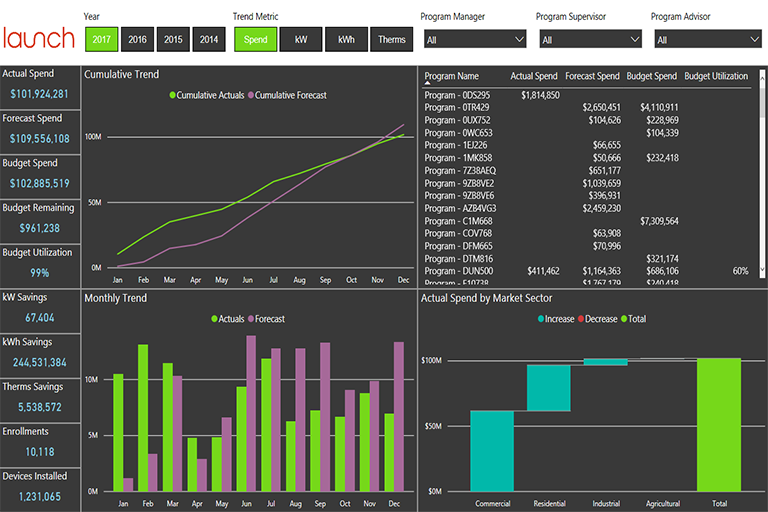 Launch builds an Energy Savings dashboard for ESG . ESG (http://esgsimplicity.com) is a provider of industry-leading energy efficiency demand-side management solutions used nationwide. 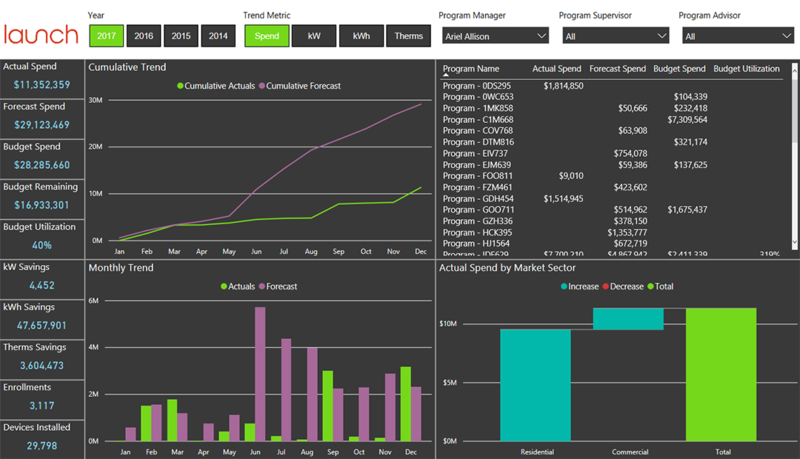 Launch Consulting leveraged Power BI to empower ESG to help energy companies save money and go green. ESG wanted to help encourage customers to switch from using incandescent bulbs to LED bulbs to save energy. A program was created to subsidize the cost of buying LED bulbs for their customers. The program managers wanted to easily read metrics regarding the cost and effectiveness of the LED Bulb Energy Savings program. 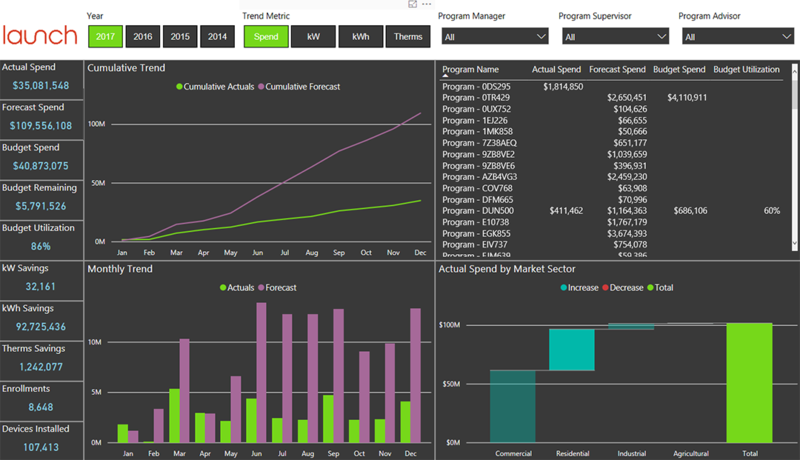 Launch created a one-page user-friendly Power BI interactive report that displays the LED Bulb Energy Savings program cost and effectiveness in a simple and attractive way. • Cost is measured in dollars and displayed in forecasted and actual amounts. Now program managers and stakeholders have the information they need at the tips of their fingers to instantly view and make informed decisions regarding the LED Bulb Energy Savings program. 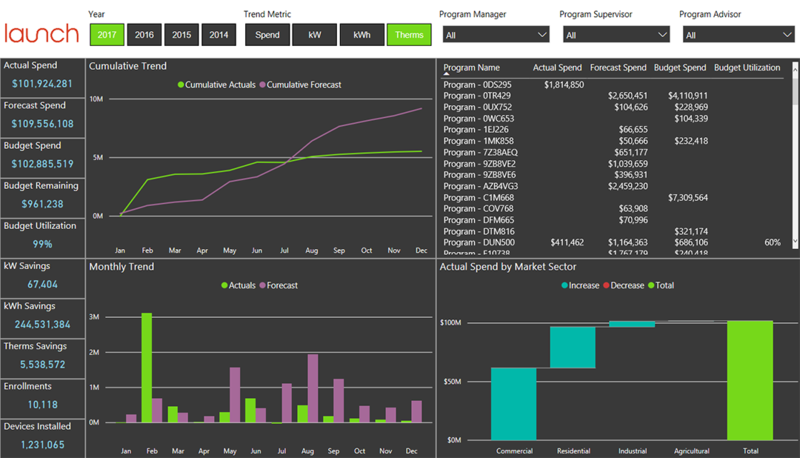 Our Power BI solution displays cost (Spend) of the program and effectiveness (kW, kWh, Therm) in one page. The toggle buttons at the top were used as an alternative to creating separate pages or tabs and multiple visuals with repeating information. This special feature allows for maximum use of space and views that render instantly. View all your information quickly on one screen! Launch Consulting turns data into value that helps companies gain a competitive advantage. We are expert at Cloud and Hybrid Services; Cloud Analytics including Artificial Intelligence, Machine Learning, Operational Reporting and Rich Visualizations; Business Consulting and Transformation, and Customer Experience. We are trusted advisors to enterprise clients in markets across the US. As a Microsoft Gold Partner in Cloud Platform, Data Analytics and Data Platform, we enable rapid transformation for the future through solution accelerators including our Launch Forecaster Bots.